I started with a A2 size card. First layer is Basic Black sized to 1/16" smaller than the base. Beautiful Life Leaf was cut to 4" x 5 1/4", corners were cut with a ticket corner punch, then lightly sanded with sanding blocks and pierced. 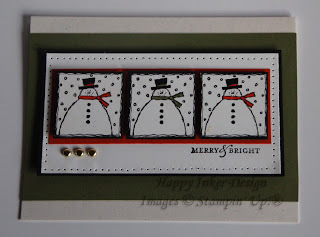 I used my Cuttlebug to cut two shapes with Top Note die - Basic Black and Boho Chic. With my paper snips I cut off the perforated part and then I matted it on black. Prima flowers were coloured with SU! re-inkers, pierced and a gold brad was put through each. 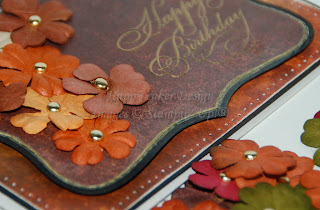 I stamped Happy Birthday in Versamark and embossed with a gold detail embossing powder. The shape of the inner Top Note was traced with a gold gel pen. 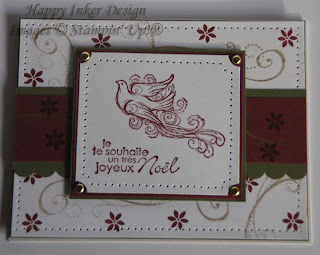 I popped the central piece with dimensionals and added Prima flowers with mini glue dots. Voila! 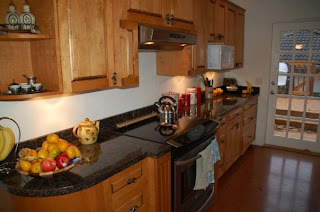 My Kitchen - mostly done!!!! 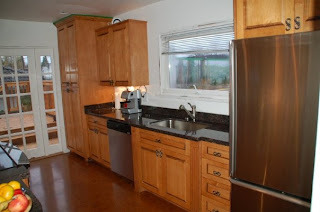 Many of you have asked over the past four months about my kitchen. So, here is a very quick post with two pictures of what it looks like now. If you were to scroll way down, back to August I believe, you could see how it started. Off to clean my office now. It looks as if a big bomb went off in there. Blog you later. I admit. I am a bad blogger. What can I say. Many things happening in my life and then we went away. We spent few days at Birch Bay State Park down in Washington State. You know, those State parks are great when cold weather arrives. Unlike our provincial parks, they have hook-ups for our motor home, plus they stay open all year. And they are a great deal for just $25 a night. We spent some time playing on the beach in the rain, went trails hiking, pretended we were great hunters chasing a bear... and watched people. People coming to State Parks at this time of the year are either really huge outdoors lovers as we are, or have a sad stories to tell. There was a woman there, all by herself, not really sure how to operate any of the RV features, how to hook up or use amenities... "It's a long story why I'm here all on my own", Fran tells us in her deep Southern accent. Her RV looks as if she packed up everything that ever meant anything to her. There are pictures, clothes, little notes scattered throughout her RV. A whole lifetime. There was a Volvo station wagon there too. An older lady and her two cats sleep, eat and entertain each others in there. The only time she came out was to use the bathroom nearby. I can't help but wonder what her story is. On to the cards... I haven't posted for so long that I think you should have more than one card to see. So, here they come. 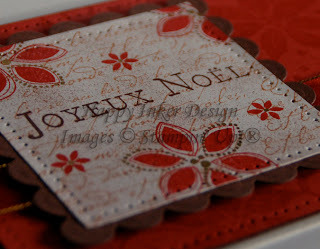 These are the cards I made for a big order in Quebec for a friend of mine. 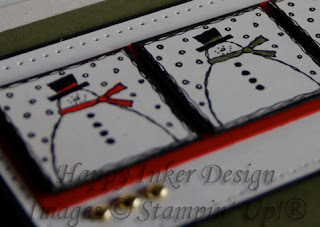 I also made lots of cards for people around here. 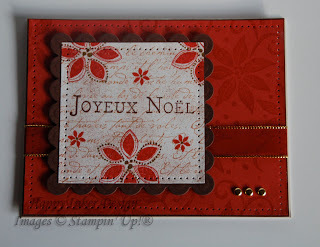 You can find my cards in Campbell's Gold farm gift store in Abbotsford now. They have some amazing honey, wax and pollen products, pottery and mead! I might end up working for mead, who knows! Lol. 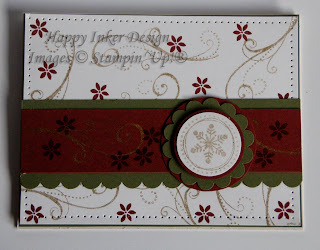 I will show you just one of many cards I made lately. I have to save something for later. I hope I kind of made up for not posting so long. I'll try to be more on top of things from now on. Honest. Blog you later.